Crane and materials handling specialist Tadano Oceania has relocated to its larger premise in Wetherill Park, New South Wales to better serve its NSW customers. Tadano NSW sales rep Justin Andrews standing in front of the brand new Wetherill Park branch office. The new facility is fully dedicated to the sales, spares and service of Tadano cranes. Heading the new premise is NSW sales rep Justin Andrews, Amanda McKenna in admin support and Noel Henderson looking after the service department. Andrews says the relocation is further evidence of the company’s commitment to its customers in the Sydney and NSW markets. "There are massive opportunities for the Tadano brand in these markets," he says. "To supply the best quality crane to customers, we understand that a direct factory presence is essential." The new 1600 sqm site at Nello Place, Wetherill Park will allow Tadano to carry and stock German, Japanese and American Tadano cranes which are relevant to the NSW market. These include the Tadano ATF40G-2 and ATF70G4, both all-terrain cranes. 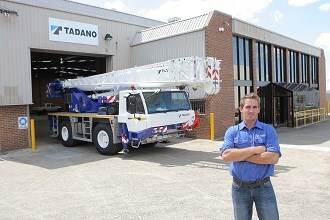 The popular truck crane, Tadano GT600EX will also soon make its way to the new premise. Besides cranes, the complex also has ample space for parts store and a service workshop. Tadano’s new NSW facility is located at 9 Nello Place, Wetherill Park NSW 2764. 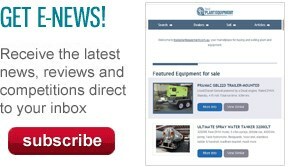 Find Tadano cranes for sale.